Maybe I'm just doing something really wrong, but I have everything right until I get to the downloading pixelmon. When I go to hit Download Launcher, all i get is a .exe file. This just brings me to text edit. I know that I'm doing something wrong, I just don't know what. Any helped would be appreciated, thanks! I'm assuming you're using OS X? To my knowledge, the Pixelmon launcher is only available as a .exe -- therefore it's only available for Windows. If you want to use Pixelmon on OS X, you'll have to use a different launcher. Download the mod, NOT the launcher, and install it as you would any other Forge mod (i.e. the way this thread explains). Where's the "go" button in finder (on mac)? When ever I click on the (click here to install) links it doesn't work can someone send me the link? Been trying to download pixelmon for myself and my son for 6 months now. You're instructions were really clear, (we use Macs)...it almost worked but we got a launch error :(. Any clue what we're doing wrong. The links in your instructions don't work on a mac so we just went directly to http://pixelmonmod.com/downloads.php and downloaded the first file. Is this the right download? Appreciate any help. Error message below. I don't play Pixelmon, but I think I can help a little here: the first file listed at that site (of the core downloads, rather than the launchers for Windows) is for Minecraft 1.8.9, while you're using Minecraft 1.7.10. 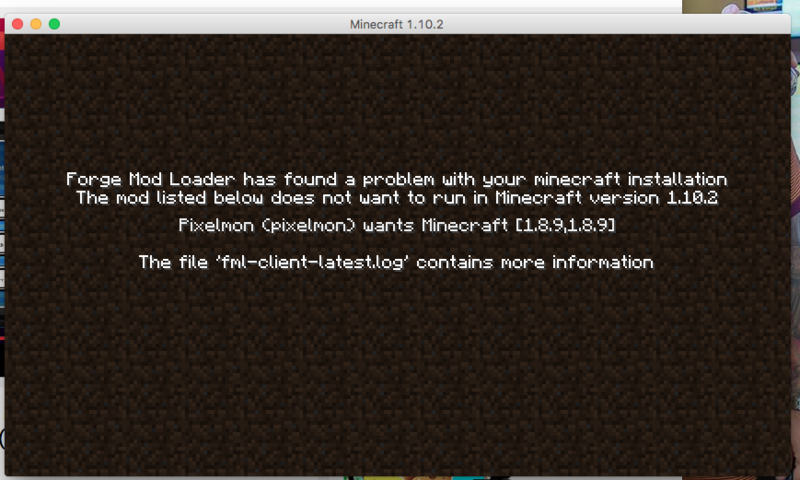 Either update Minecraft and Forge to 1.8.9, or go down a few files and download Pixelmon 3.5.1 for Minecraft 1.7.10. I did every step but when I start minecraft it freezes on the mojang screen and doesn't load. Hi there. Whenever I try to click on the download pixelmon link it just takes me back to this page. Thanks for your help. When ever I click The link "Click here to install" It just brings me back to the top of the current page? I followed all these steps but keep getting this message whenever i launch the game. I have a mac. Any idea of what I have to do to fix it? For me, I'm a mac user. I downloaded forge, but then when I put my mod (Pixelmon) into my mods folder, id doesn't go through. Why is that? I need help! 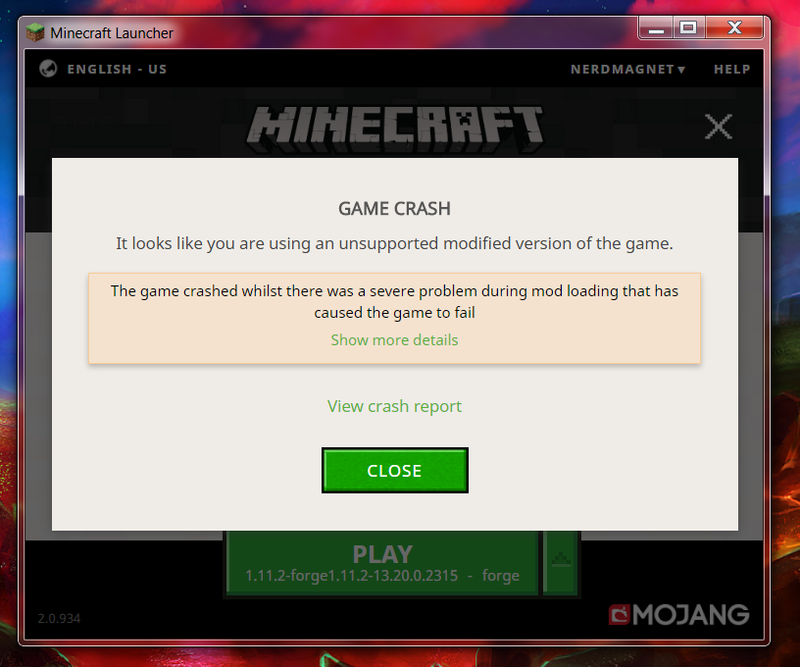 I have installed forge correctly and everything, but minecraft crashes whenever I open it with the forge installed! [13:46:27] [main/INFO] [STDERR]: [java.lang.Throwable$WrappedPrintStream:println:748]: ... 25 more"
I'm a noob. Pls help? i'm a new to mods and mac os x sierra,i've followed every step he listed.after that i opened my minecraft,i saw no mods.can i please have some help. I tried to run Pixelmon but the game just crashes. I thought maybe I was being retarded, so I ran just vanilla Minecraft, started up without a problem. Removed Pixelmon to run JUST Forge, started up without a problem. Put Pixelmon back in the mods folder, and I always get this. I can't even access the crash report, so I have no idea what the heck to do. Does anyone have a pixelmon file they can send or share with me for MAC. They have deleted the mod. Thanks.